Musician-composer-poet-field recordist. An early example of a kind of bedroom radical in the mould of glitch pioneers of the 1990s and sound recordists of recent years such as Chris Watson and Hildegard Westerkamp. Based in the village of Monivea just outside Galway, Giolla took up the fiddle in his early teens, later playing professionally as a solo performer and, later still, in dance halls around Galway and Clare in his twenties. Though this early experience as a trad. performer enmeshed in local ritual and community would prove crucial, what was perhaps the pivotal moment in Giolla’s musical life came in the late-1920s. As described by Andrew Andrewnine, author of the most substantial extant critical text on Giolla (2008), somewhere around 1928 or 1929 Giolla heard 2RN’s early transmissions in the local Parish Hall in Monivea and duly became fascinated by early radio and recording technology. Combining his love of folk music of Ireland and America (the work of Francis O’Neill and also, notably, John Lomax’s Cowboy Songs and Other Frontier Ballads are said by Andrewnine to have been key musical influences), his fascination with anthropological studies by Franz Boas and Margaret Mead and ethnomusicological collecting by the likes of the Lomaxes, Giolla began to explore folkloric traditions as a collector. Now known to friends and locals as ‘Zaftig,’ after he took a fancy to this term upon hearing it on Yiddish radio broadcasts from New York, Giolla acquired a Presto Model “K” Recorder in 1933 and spent a number of years documenting village rituals such as keening funeral rites and crossroad dances (capturing a number of interesting examples of the latter before the Public Dance Halls Act of 1935 effectively imposed commercial controls on these). A fairly wide selection of Giolla’s recordings of this kind can be heard in the Giolla-McKiernan Collection at the Irish Traditional Music Archive. Giolla’s ears turned towards Europe in the 1940s and 1950s. He paid keen attention to the melding of electronic and acoustic music in the work of composers such as Edgard Varèse and John Cage, as well as developing what was to turn into a near obsession with Futurism’s pursuit of the clang and thrum of city life – Andrewnine even describes Giolla’s fundamental achievement and desire in terms of constructing a ‘Futurism of the fen and the bog’ (2008: 90). After getting his hands on a rudimentary theremin in 1943 and constructing his own version of Luigi Russolo’s intonarumori ‘noise box,’ Giolla began to combine his field recordings (now made via a wire recorder and a reel-to-reel tape machine, and dominated by landscape recordings of marshes and bogs near his home in Galway) with these otherworldly electro-mechanical sounds, developing highly sophisticated methods of tape manipulation and tape/theremin/intonarumori synchronisation based on a complex system of pulleys and triggers. Combining these techniques with light projections and self-written poetry inspired by William Carlos Williams (see Appendix 4 for a putative example of Giolla’s poetry, as collected in the Keening Women’s Alliance Extraordinary Proceedings), Giolla began in the late-1940s to put on what he called ‘Lighttrancing dances’ in small rooms around the country. At these dances, according to Andrewnine, Giolla would coordinate recordings and live electronic sounds with lights and poetry readings, sending small but receptive audiences into reverie (2008). These dances continued intermittently throughout the 1950s, with one, for example, taking place in O’Brien’s pub in Cork in 1957 and another in Wesley Rugby Club in Dublin in 1958 (DarkMatterBird 2011). 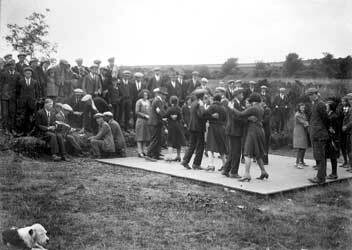 Giolla used income from lectures about his work to support this activity, although the meagre income Giolla received from these lectures was not enough to parlay the resolutely non-commercial lightrance dances into anything more regular than occasional diversions into the ether of the avant-garde for unsuspecting, strange-starved Irish audiences. Giolla died on 19 June 1959, three days after falling asleep whilst recording the burps and harrumphs of a marshy area near his Monivea cottage and being bitten by a stray dog believed to have rabies. His relatively early death, at a time when electronic music was soon to evolve dramatically and great social change was likewise on the horizon, means that much of Giolla’s music has been lost to the fug of 1950s cultural indigence. Beyond the ethnographic field recordings of the 1930s, indeed the only surviving recorded examples of Giolla’s work can be found on Before The Who, a 1998 anthology of electronic music that includes Giolla’s 1957 theremin and tape depiction of the birth of knowledge, Logoverse, and his 1958 electric bog piece Prismatic Sounds. Despite this dearth, however, curio interest in this near-lost era of electronic music means that Giolla’s work has not been completely lost to time. Authors such as Andrewnine and various web sleuths have uncovered oral accounts of Giolla’s innovations substantial enough that at least some concrete sense of what this unheralded pioneer, this seer of Irish traditional culture as magico-electro ritual enchanted with the imminent and the impossible, was actually up to in all his grand small sonic, spiritual and technical explorations and experiments. Andrewnine, Andrew. 2008. ‘Folk electro-experimentalism in Ireland and the UK,’ in Belfry Smith (ed. ), Stray Noises and Strange Sounds: Electronic Music Before Electronic Music, Surrey: Mashgate, pp. 78 – 113. Boydell, Brian. 1951. ‘The future of music in Ireland,’ in The Bell 16, pp. 21 – 29. DarkMatterBird. 2011. ‘Giolla and the lighttrancedance,’ http://soundsunderground.wordpress.com/10/8/11/giolla-and-the-lighttrancedance, accessed 29 October 2014. Jeckerlover. 2012. ‘Electronic warriors: Review of Andrewnine,’ www.outeroutersounds.com/andrewnine/electronic, accessed 2 November 2014. Various. 1998. Before The Who: An Anthology Of Rare And Unknown Electronic Music From Beyond The Centres, Arkivo Discs, AD 346 11. This entry was posted in Noise, Tape, Traditional Music, Vocal. Bookmark the permalink.